Two weeks before traveling to Tilting Axis: Within and Beyond the Caribbean – Shifting Models of Sustainability and Connectivity at the Fresh Milk Art Platform in Barbados, I listened to a podcast titled The Inner Life of Rebellion, a conversation which included Courtney Martin. During my presentation at Tilting Axis, about the vision and work of Groundation Grenada, I shared the above quote by Martin. Her reflections on the power of being able to make progress even with full recognition that we are imperfect and always in-the-making resonated with me deeply. It is this kind of ‘showing up’ as a whole complex person that Groundation Grenada seeks to support. As an organization our aim is to create safe spaces for people in our communities to explore the fullness of their experiences and express themselves in an environment that honors our differences. Tilting Axis was a unique moment to connect with founders and directors of initiatives that similarly work to support and enhance the growth of the Caribbean’s vast array of voices & creative visions. Tilting Axis, held from February 27-28, 2015 aimed to promote greater conversations and engagement between artists and professionals working within artist-led initiatives across the wider Caribbean region, build and redefine historical relationships with those in the North, and establish open dialogue with active networks emerging in the Global South. The space that the organizers Fresh Milk Art Platform Inc., ARC Inc., Res Artis and Pérez Art Museum Miami were able to create was a rich opportunity for discussing challenges and envisioning collaborative solutions. They brought together several of the region’s arts initiatives to engage in face to face conversations. Also present were a number of professionals from outside the region interested in working with Caribbean-based initiatives such as Solange Farkas, founder and director of Videobrasil (Brazil), and N’Goné Fall, a founding member of the Dakar-based collective GawLab (Senegal). For a complete participant list and other details read the official post-conference press release (here). There were many existing relationships and partnerships in the room and many possibilities for new collaborations discussed in formal sessions and during tea breaks. Technology has been an invaluable tool in facilitating the growth of what feels to me like a tangible movement in the region via the visual arts. Being in the same physical space as such a dynamic group of artists, curators, writers and organizers, and being able to have real conversations, was an invigorating experience. We all showed up as our full selves, open to discussing the complexities we are working with and through. It was an intergenerational setting with cross-pollination between organizations that were founded decades ago and seedling organizations that are now taking root and beginning to bloom. Read the full report on Malaika’s website here. 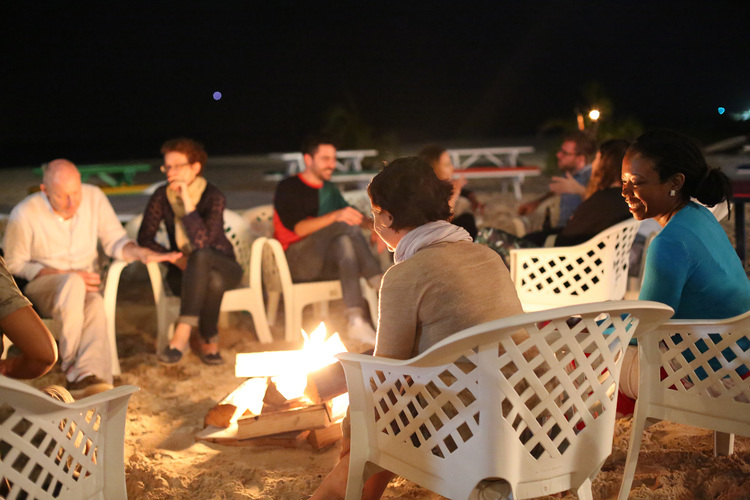 The two-day conference ‘Tilting Axis: Within and Beyond the Caribbean – Shifting Models of Sustainability and Connectivity’ was held at The Fresh Milk Art Platform, Barbados on February 27-28, 2015. This meeting aimed to promote greater conversations and engagement between artists and professionals working within artist-led initiatives across the wider Caribbean region, build and redefine historical relationships with those in the North, and establish open dialogue with active networks emerging in the Global South. Tilting Axis was supported by the Arts and Sport Promotion Fund Committee (Barbados), the Davidoff Art Initiative, the British Council and the Prince Claus Fund. Take a look at a short video from the second day of Tilting Axis. Thanks to Sammy Davis for shooting and editing this video! Take a look at a short video from the first day of Tilting Axis. Thanks to Sammy Davis for shooting and editing this video!